Hello Stampers! I hope your 4th of July was a blast. Ours was a bit quiet this year but great none the less. 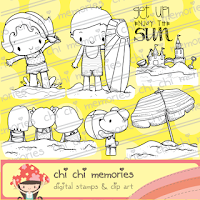 Today I am sharing a card I made using Chi Chi Memories new stamp set called Beach Time. All the images in this set are so fun and perfect for Summertime. I colored in the Beach Girl image using Copic markers. I added embossing to the blue cardstock and paired it with yellow and grey papers. The die is from MFT Stamps and for some embellishment I added some white fiber. 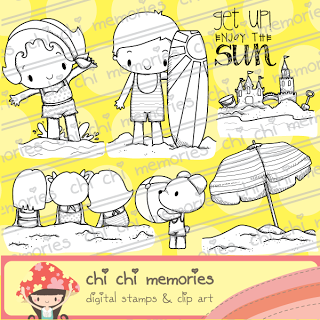 Please join the DT over at the CCM blog for more projects using the new Beach Time set. Thanks for playing our dry embossing challenge at 4 Crafty Chicks! 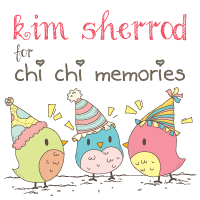 Good choice of the embossing folder with that image Kim! And "Good Times" fits perfectly with our theme... Glad you are sharing your project and best of luck in the “Two Word” Sentiment Challenge! Oh, this is just so darling! Thanks for playing along with Mojo Monday! What a cute card - I love the colors. I made a card for the Mojo 300 Challenge using the same image...great minds think alike?! What a sweet little beach girl! I love your soft colours, and the combination of the dotted paper and the circles ef looks just great. Thank you for joining the CCEE Stampers this week. what a sweet little girl at the beach! Great coloring and layout too. Thank you for joining this week's challenge at DRS Designs. A wonderful beach scene. hank you for joining us for the CCEE Stampers challenge. A great beach scene card! Love your embossing texture and the yummy summery colors you used. Thanks so much for joining us this week at ATS&M. Very pretty card :) Thanks for joining us at 4 Crafty Chicks this week for our "dry embossing" challenge!